Ok, so you own a pond or lake and feel a floating fountain would be a great addition and a beautiful visual display. But, do you hear lots of floating fountains, spray patterns, and nozzle types. How are you supposed to understand the difference? Well, actually our nozzles are what create the different spray patterns and can be interchanged on our floating pond fountains. So, you choose the Horsepower Fountain you want and the nozzle you want to be put on that Fountain to create the spray pattern you desire. Floating pond fountains provide aeration because anything that moves water provides aeration, however their main job is to provide you with a visual water display. If your main goal is visual appeal, then you’ve selected the perfect solution! For example, a 1/2 HP Fountain will move 70 gallons of water per minute; where as a ½ HP Aerator will move 500 gallons of water per minute. On a bit of a bigger scale, a 3 HP Fountain will move 150 GPM, and a 3 HP Aerator will move 2700 GPM! 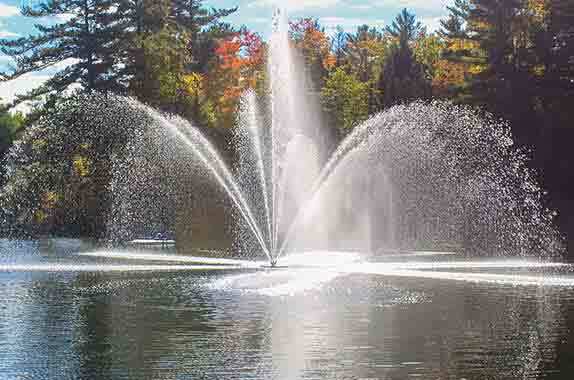 In smaller shallow ponds though, a fountain can be enough to provide primary aeration. A outdoor commercial quality floating pond fountain should reflect you and your style. We have 6 different spray nozzles that you can choose from for your fountain. This ensures a Fountain you are sure to love. You can check out the various spray patterns here.